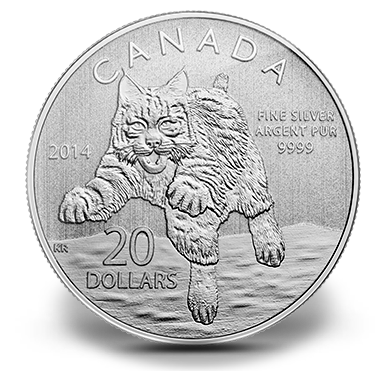 Like all other $20 for $20 program issues, the $20 face value Bobcat Silver Coin can be purchased for that legal tender value of $20. Each is struck from fine silver (99.99% pure). A household order limit of three is in place. 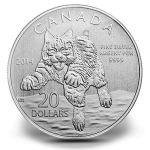 Shown on the reverse of each coin is a design including a single bobcat in a traditional Canadian background. Inscriptions surrounding the design include CANADA, 2014, 20 DOLLARS and FINE SILVER ARGENT PUR 9999. The reverse design is the work of Canadian artist Ken Ryan. The obverse of the legal tender coin contains Susanna Blunt's portrait of Queen Elizabeth II. Inscriptions include Elizabeth II and D G REGINA. The program has proven popular with collectors owing to its changing reverse imagery and the fact that each coin can be purchased for its legal tender face value. All but the most recent two issues of the program have sold out. A subscription program was also recently unveiled for the program. Maximum mintage for the Bobcat Silver Coin is limited to only 225,000.